Here is an interesting twist on what's happening to this country. These photos were taken by my friend Greg Simmons from a small boat on Skaneateles Lake. I grew up less than a block from the lake. Greg lived even closer. When we were kids, the lakeside was dappled with small camps. Nowadays the working people who used to own personal little slices of paradise have (mostly) been driven off by increased taxes or simply bought out by wealthy people. The rich folks bulldoze the humble cottages and replace them with garish monstrosities. Many of the best views of the lake are now blocked by dwellings that beg the legitimate question: just how much do you need? Worst of all, many of these homes sit unoccupied even in the summer. So the wealthy cut others off from something they haven't time to enjoy themselves (in some cases because they are at their other vacation homes.) Gosh, I'd sure hate to see taxes raised on people with enough disposable income to effectively cut off thousands of their fellow humans from a cool lake on a hot day. 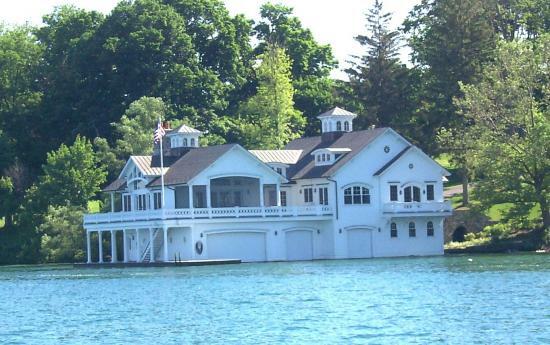 The second photo isn't a house, it's a boathouse. What's in there? The Queen Mary? Thanks, Greg! Please add your commentary. And thanks to everyone who has sent along pictures. They will be seen here and soon they will all be gathered in a repository on this very website. Keep 'em coming!